“Vikings versus aliens.” If those three words weren’t the entirety of Outlander’s pitch, they should have been. If those three words don’t make you want to watch this movie, then you and I probably can’t be friends. 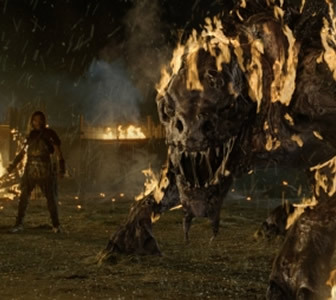 You are forgiven if you thought this was a Balrog. After all Outlander is "from the Producer of 'Lord of the Rings'" and features a character named Boromir. Our friends will note from previous reviews that we at TBTS have several categories of “good,” most of which are mutually exclusive. Outlander is by no means “good” as in “high quality,” but it’s not really meant to be. It is “good” as in “entertaining,” which it is. This film is fun to watch largely because the people who made it understand what it’s supposed to do. It’s supposed to be loud and absurd and unbelievable. It succeeds on all those fronts. Outlander has beheadings, disembowlings, even montages (plural!). It has hot, drunken Viking wenches and dudes; characters named Wulfric, Rothgar, Unferth, Gunnar, and Boromir; spears and bears; swords and hordes; and literally heaps of bodies. It’s only 115 mintues long. In other words, it has something for everyone. Well, almost everyone. If anything, it needs more skin—not a single boobie, even though the movie is rated R—and more explosions (Iron Age technology wasn’t known for pyrotechnics). Maybe you’re rolling your eyes thinking, “so it’s just a coincidence that Mr. Humanoid P. McAlien crash-lands on Earth, which happens to be filled with humans so he doesn’t look out of place?” Outlander explains that with a moderately-convincing three-second computer-screen graphic, then completely forgets it. If you’re wondering how in a matter of minutes he supplants his own space-language with ancient Norse, which is apparently identical to slightly dated English and spoken with a British accent by Vikings but an American accent by our visitor, that’s explained, too, in a scene that will make you avoid cramming for a test ever again. If you’re noting that the “dirty” people look like they just had dark makeup smudged on their faces, you’re probably right: they’re actors, not actual peasants, so it’s most likely cosmetics and not real dirt. If you’re incredulous that the same warrior from 1300 years ago who uses leather as armor also has a full mouth of perfect, glowing white teeth…well, that’s not explained, but it doesn’t frigging need to be because it’s a goddamned movie about goddamned Vikings fighting goddamned aliens. Honestly, if you’re asking these questions, you’re watching the wrong movie. It doesn’t matter than Outlander didn’t do so well, or that it opened up in the States after it premiered in Latvia. I don’t see YOU making movies about hammer-wielding Norsemen fighting xenomorphs that look like Tron suits. When you do, we can be friends. That last paragraph made me LOL. Great review of a great movie. Outlander really must be seen to be believed. I will be saving my hard-earned money for “Sumerians Vs. Frankensteins,” thank you.